This is such a better explanation and way to do this than I read in sewing magazines, so thank you!! I wasnt planning on an exposed zip but seeing this has me thinking I could do it. I cut out my Hollyburn out and will sew up at weekend. I’ve never inserted an exposed zip before. I’ve always been slightly intimidated by them. Thanks for the tutorial. I will definitely try an exposed zip using your method in my next skirt! Great tutorial. Exposed zippers make me cringe. I’m also really digging the flat piping!! Do you have any tips or suggestion on how to hide the serged edges? I have an aversion to exposed edges of any kind! The only thing I can think of is to bind the edges after the zipper is inserted..but wondering if there’s a way to do it without any extra binding during the zipper install itself? Hi! 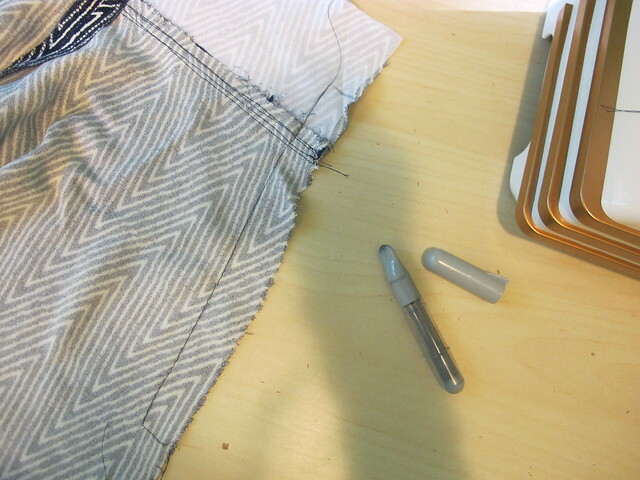 I think your only option would either be to bind the edges after installing the zipper or insert a full lining. Any other way to hide the edges would probably be too bulky.